Editor Note: We covered this issue back in November of 2014 when it appeared that the community had come together on a less divisive plan. That was then. This new plan eliminates all protected bike lanes on University Avenue. 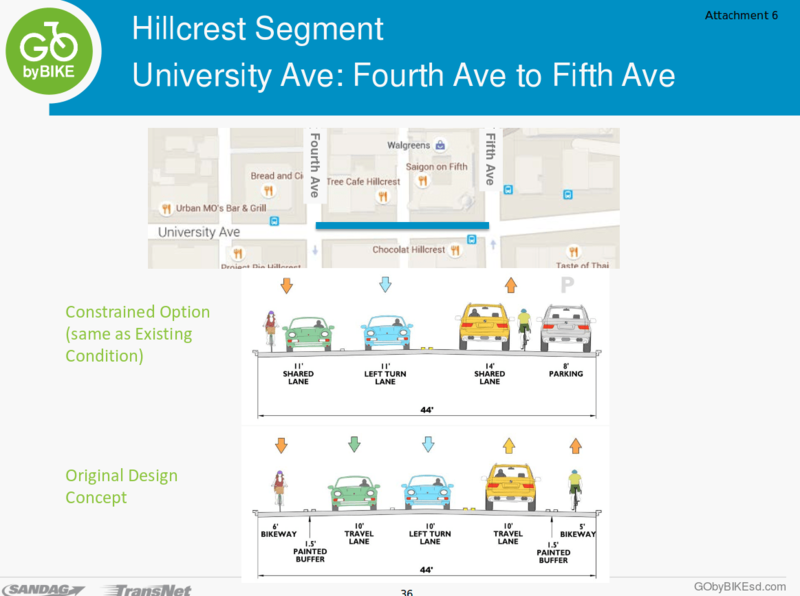 After more than two and a half years worth of community meetings on how to make Uptown a safe place to walk, bike, take transit and drive, SANDAG staff has decided to stop the entire process and gut any sort of safe bike infrastructure for University Avenue. SANDAG staff is recommending sharrows (or, no changes) for University Avenue (as you can see from the visual above). This Friday – you have a final chance to speak up for a safe Uptown and a safe place to ride on University Avenue. SANDAG, our regional metropolitan agency, will have their Transportation Committee meet this Friday at 9AM. There is only one item on the agenda: Uptown Bikeways. When: Friday, June 5, 2015 at 9AM. How to get there: Bike parking is located both in the front of the building and in the parking garage. The venue is also accessibly by the trolley and bus. While this Friday’s meeting is being held at the start of a workday – you speaking up will make sure that the process continues and that SANDAG come back to the community with an alternative alignment that aligns with both community values and the desire for a safer way to get through Uptown. University Avenue is the most dangerous corridor in the city of San Diego and SANDAG has proposed “sharrows” – or no bike facilities. SANDAG was tasked with using tax funds to the tune of $40 million dollars to spend it on safe bikeways. However staff under the direction of SANDAG’s executive director, Gary Gallegos, (who reports to the board of directors composed of your elected officials), is recommending that no facilities be implemented on University Avenue. I wish this wasn’t in the morning. I can’t take the time off work but I hope all works out. If you can’t make it to the meeting, email Alex Estrella, share with him your concerns, and ask him to take your concerns forward to the committee meeting. He is the Project Manager and Senior Transportation Planner. Thank you. I think I will do that.